Located in the outer suburbs of Perth, Western Australia, in the Southern Hemisphere, my observatory is well located for research and photographic activities. The observatory is particularly well suited to observing southern regions of the sky. I am always looking for new opportunities to expand the use of my observatory. The observatory is well equipped for automated observations using either narrow field (10.6′ x 15.9′) or wide field (wide range of combinations available upon request). See later on this page for equipment information/statistics. Below is a summary of past automated observing nights. Nights where observations were made but manually rather than automated are not shown. Observatory Automated Nights Per Month (for Roger Groom’s observatory in Western Australia) from 2008 until 2015. The observatory is located in the outer suburbs of Perth Western Australia, approximately 30 kilometres from the central city at an altitude of 218 metres. Light pollution from Perth is significantly deminished at this distance from the city. Specific lattitude and longitude are available upon request. Perth has a mediterranean climate, having warm to hot dry summer months, temperate spring and autumn, and moderately cool winter months. This means that most of the year the weather is fine and sunny, with a corresponding relatively large number of clear nights. The months of best stability and transparency are April through November. Typically summer months (December through March) have lower viewing quality due to higher temperatures and more frequent strong winds. The following table outlines the climate information for Perth Western Australia which is most relevant for astronomical purposes. * Number off dark hours is the number of hours between end of Twilight (dusk) and start of Twilight (dawn) per night (assuming the whole night is clear). Dark Hours calculated from TheSky6 Sun/Moon Report for the 15th day of each month based on 2011. * Climate data provided by Australian Government Bureau of Meteorology for Perth Airport station. 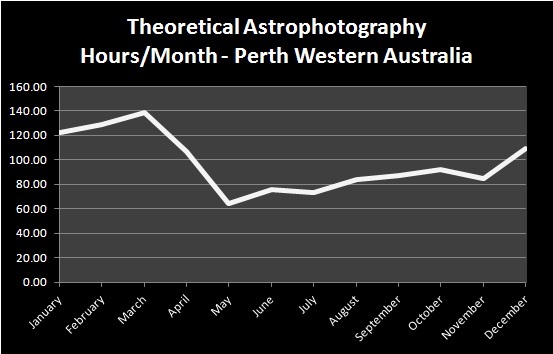 Theoretical number of astrophotography hours per month for the Perth Western Australia area. Optical: 12″ SCT with native 3048mm focal length, usually used at 2180mm focal length. Mount: Paramount ME, fully automated. Optical: 90mm refractor with native 690mm focal length, usually used at ~580mm focal length. The observatory is capable of automated operation, particularly the 12″ telescope. Full automation is implemented including monitored weather and roof automation, allowing for maximum utilisation of clear nights. The observatory cannot be accessed and controlled remotely at this stage due in part to the limitation of initial synchronisation being required. The observatory has almost unobstructed views to the south, south-east and entire zenith area. The North, North-East and West are the most obstructed largely due to trees. The following illustrates the local horizon. Requesting observations which the observatory operator (myself) will perform. Providing ready-made CCD Commander scripts which can then be executed by the observatory operator. At this stage remote control of the observatory is not provided to external parties. To request use of the observatory please contact myself to discuss what you require and options available to suit. The cost (if there will be any) to you of using this observatory will depend upon the nature of your request request. Please contact myself to discuss what you require. I welcome any enquiries regarding the use of my observatory, particularly for scientific research activities of which I can participate in. I am happy to spend time discussing your requirements with you to determine if the observatory is suitable for your tasks. Please contact myself to discuss what you require.